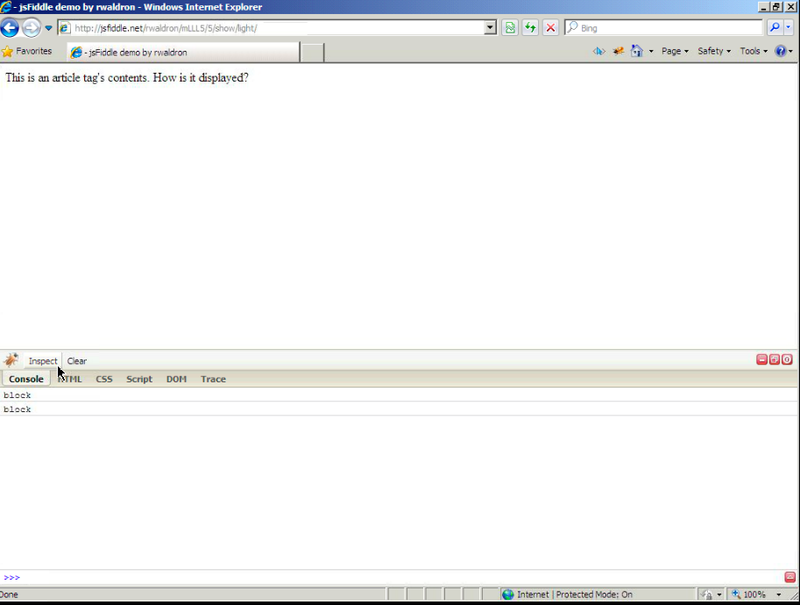 Bug exists in IE <= 8. I've only tested in IE8 so far--of the affected browsers. I used the Microsoft provided IE8 testing VM (Windows 7) running inside VirtualBox on Mac OS 10.6.8. When using jQuery 1.7.2 with Modernizr 2.5 (or other shim/shiv options), using show/hide on an 'article' (or other HTML5 tag) the 'display' CSS property is set to 'inline' rather than 'block'--which is the shived value. The "Show the Article" button will '.show()' the 'article' tag. In non-IE browsers (and IE > 8) the content will state that 'display' is set to 'block'. In IE <= 8, the output will state that it's set to 'inline'. Modernizr/html5shiv/html5shim will sets some display defaults, but defaultDisplay (in effects.js) retrieves the 'display' value from what the browser reports when the element is inserted in the DOM--which is the non-shived value. defaultDisplay will need to check if the page is "modernized" and if so, use the Modernizr/shiv/shim value instead. Maybe making defaultDisplay override-able in some way could let Modernizr (or similar) tweak what .show() does without having to hack this into jQuery directly. Still not sure if it's something we can fix easily. Should I still be running this test in a specific browser? eg. IE8?